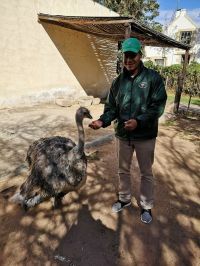 Cango Ostrich Show Farm is located in the lush Cango Valley, Schoemanshoek, 14km outside of Oudtshoorn on the main route towards the world famous Cango Caves, making it easy to find and making your trip more time efficient. We have a very exclusive style whereby we ensure each person individual attention. We pride ourselves on our service standards and hospitality. The farm is privately owned and managed. We believe in good family values, development of staff, proper farming methods and conservation of our rich heritage and the environment. We value our long term relations with clients, and we truly treasure the friendships we forge with every person who visits us. The farm environment is visitor- & disabled friendly and easily accessible. Our farm layout ensures shady comfortable conditions for those who want it. Welcome to an awesome experience you will never forget! Exciting guided tours - start every 20 minutes, daily from 08H00 till 16H30 and take 45 minutes. We have taken the initiative and are first in the Oudtshoorn district to stop the riding of ostriches. Our company policies have always been very animal-friendly and we welcome the global trend towards less invasive handling of any animals. Looking forward to a multitude of happy ostrich encounters! Stoffie - One in a Million!!!! Cango Refreshed Look!! Ready to give Superb service! Cango Ostrich Farm complies with the Bio Security Regulations and Standards set by the Department of Veterinary Services. The farm is registered as a production, export and show farm.